How long does an HTTP request take? 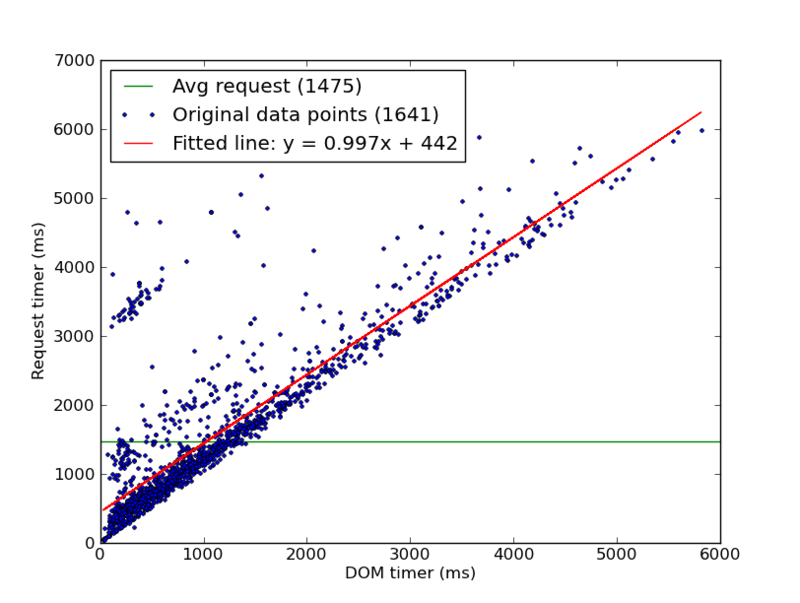 Statistical analysis of page load speed data collected using the Navigation Timing API shows that an HTTP request can be reasonably approximated to 0.5 seconds. The tracking pixel returned a 204 (No content) status code. The server logs for the test period were filtered for references to the tracking pixel, concatenated and passed through a Python data processing script. This performs a liner regression using least squares to find the best fit to the equation: request_time = multiplier x dom_time + constant. In order to prevent outlier results adversely affecting the result a cut off was placed on both the request time and the DOM time: if either is greater than six seconds then both are discarded. Based on 1641 data points, the average request time for a page was 1.475 seconds. The discrepancy between the in-page timers and the performance timing API was found to be consistently less than 50ms which is an error of ~0.05% on the average measured DOM load time and so could be effectively ignored. It also shows that using in-page timers is a valid substitute for the the timing API. The measured values for the formula request_time = multiplier x dom_time + constant give a multiplier of 0.997 and a constant of 0.442 seconds. It is important to note that, at the time of conducting the experiment, no common mobile browsers supported the timing API so it is reasonable to suppose that the majority of this data was gathered on fast connections where we would expect the overhead of a request to be minimal. Based on this research is it reasonable to use the approximation of adding 0.5 seconds to the time measured to load the DOM using in-page timers to estimate the time taken for the full request. Comments, suggestions, corrections? Reply to this post on Twitter.